Day 283 – Casa TaMas! When Roberto Duran faced Sugar Ray Leonard in 1980 in a rematch of their earlier bout, Leonard’s strategy was to taunt and frustrate Duran believing it was his best chance to beat Duran. It was a short bout that promoters had pretty much decided. In the eighth round, Durán, slightly behind on all three scorecards, shortly after a vicious right uppercut from Leonard, turned around, walked to his corner and gave up, supposedly saying the now famous words, “no más” (no more). However, he claims to have actually said, “No quiero pelear con el payaso.” (Meaning, “I do not want to fight with this clown.”) Another version of events has him saying, in Spanish, “I can’t continue.” Referee Octavio Meyran, perhaps as incredulous as was the rest of the world at what he was seeing, asked Durán if he was sure, and Durán then said, “No más, no más” (no more, no more). In violation of what any professional fighter does on the day of a fight, Durán gorged himself after the weigh-in and claimed he quit because he was having stomach cramps. However, Durán’s manager, Carlos Eleta, said, “Durán didn’t quit because of stomach cramps. He quit because he was embarrassed. So tonight, we’ve opened and enjoyed a 2009 TaMas Estate wine from the Central Coast of California. A blend that includes Cabernet Sauvignon, Petite Sirah and Barbera. . .this wine is perfect for an evening on the deck. With Double Decker Red they’ve taken it a step further by creating an adventurously robust yet smooth red wine with mouth-filling flavors of blackberry, black cherry and plum, and a smooth, spicy finish. Hop on the bus for a multinational wine tour experience and stamp your passport for world taste. Yep, it’s a beauty for the money–paying less than $9 a bottle. Good nose, great taste–full body and a finish that surprised us. It’s a wine that one would probably NEVER try because of the price, but the wine is WAY better than the price suggests–which means that it’s another gem for under $10 a bottle. We need to be ready for it in the fall and you need to be ready for it NOW!!!! 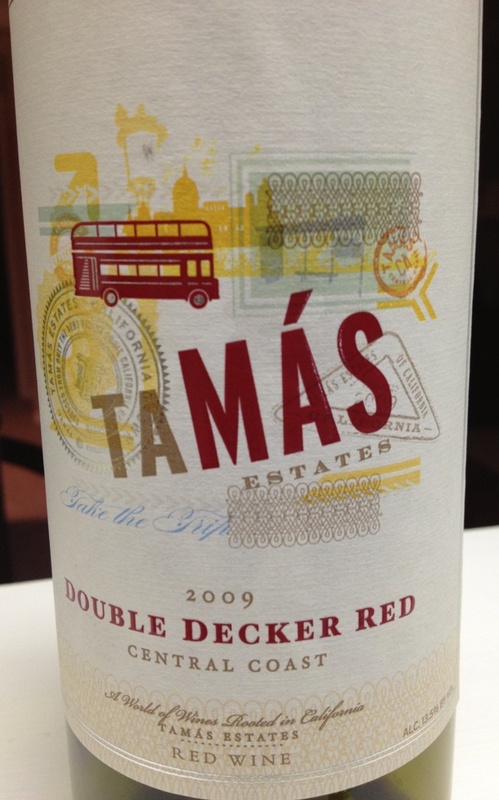 Give Double Decker Red a try–you’ll be pleasantly surprised and you won’t ever have to worry about saying, “No Mas!” when it comes to your wine ever again. Please enjoy your favorite wine responsibly and recycle whenever possible. P.S – one note of correction . . . last night’s wine hailed from Southern Spain – not Argentina . . . opps, missed it by that much Chief! Categories: Uncategorized | Tags: Andy Rooney, Central Coast. Sugar Ray Lenonard, No More, Roberto Duran, TaMas Double Decker Red | Permalink.